In a development that brings superdense memory devices and molecule-sized machines a step closer to reality, scientists at Japan's Institute of Physical and Chemical Research (RIKEN) have succeeded in creating 1-nanometer-thick electric wires with a layer of insulation. According to a January 2 RIKEN press release, the researchers grew the insulated nanowire crystals through a process involving a mixture of conductive and non-conductive organic molecules that organized themselves into the desired configuration. For perspective, 10 hydrogen atoms laid side by side measure about 1 nanometer across, and a human hair is around 70,000 to 80,000 nanometers thick. While scientists in the past have succeeded in creating nanowires from carbon nanotubes, metals and other materials, a great challenge has been to provide insulation to these microscopic wires so that they can be put to use in integrated circuits without short-circuiting. Another challenge has been to develop technology that enables nanowires to be arranged into regular arrays. 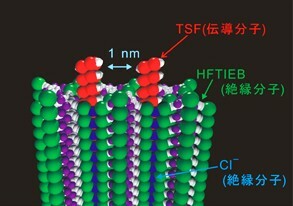 RIKEN researchers have overcome these challenges by developing a nanowire growth process that uses a tetrathiafulvalene (TTF) derivative -- an organic molecule that conducts electricity -- and non-conductive iodine-containing neutral molecules (HFTIEB), which together self-assemble into crystals that function as insulated nanowires. The researchers, who indicated success in organizing the nanowires into regular patterns, also demonstrated a certain degree of control over the crystal structure, creating two-conductor nanowires and insulation coatings of various thicknesses. The results suggest it may soon be possible to engineer these insulated nanowires for use in practical applications. RIKEN's insulated nanowires have the potential to be used as a basic component in superdense 3D storage media that rely on molecular memory arrays, say the researchers, who indicate that memory devices built on this technology would be able to store up to 100 petabytes (100 million gigabytes) of data per cubic centimeter, or about 400,000 times more than today's typical desktop PC hard drive (250 GB) in a device the size of a sugar cube. If used in logic circuits, this type of wiring technology would revolutionize the electronics industry as we know it, the researchers add. That's some serious storage! The technology is way over my head but i can appreciate how far it's come .... but when will it ever stop? ?